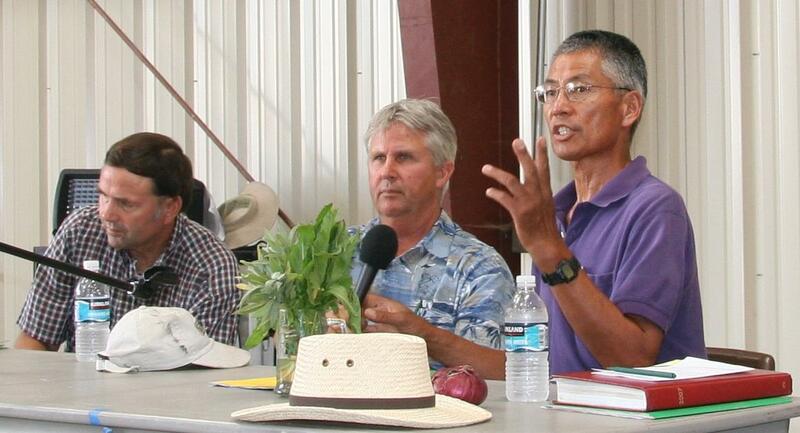 As a vegetable crop advisor, my work has varied seasonally, with different tasks over years. Lots of unexpected, unplanned activities occupy the job, from field research to farm calls to requests from local students and community, and on to international connections. Traveling to international conferences with colleagues, in Istanbul, in Mendoza, Argentina, on the Amazon, and in Melbourne were particular adventures. Lots of good memories. Locally, I was taking plant growth notes from a test plot in a commercial tomato field on a sweltering >100°F summer afternoon about 25 years ago. I'm in the middle of nowhere. The grower's 5-year old son walked a distance from his house to hand me an ice-cold drink. I don't know what prompted the youngster to this act of kindness, but perhaps the look on his face was saying, “Old man, you need to stay hydrated.” While his parents weren't directly involved in the trek nor in the treat, the youngster clearly understood that his parents valued our University efforts. I enjoy working on applied field research and the associated education programs to help with crop production issues. Working locally and connecting with the local community is the best. The network of UC colleagues to work with within our system is highly valued. I was familiar with UCCE programs delivered by local advisors, and the thought of working in an academic environment with energetic people was attractive.